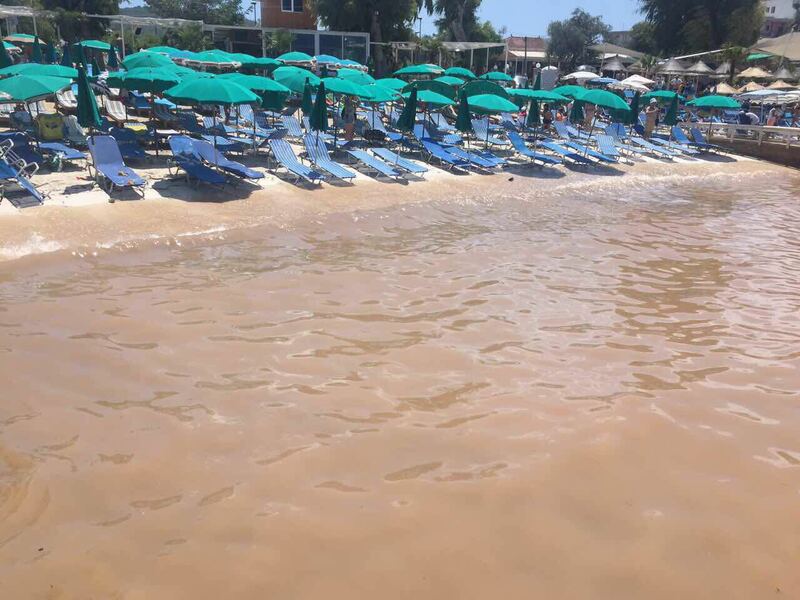 Less than 24 hours after the beach and shoreline of Ksamil were covered in a sludge of human waste, the mud fight over responsibility for the explosion of the sewerage pipe has already started. By making an urgent call upon the Municipality of Saranda and the Company of Water Supply and Drainage [UKS] to immediately stabilize the alarming situation, I strongly ask the executive institutions that immediately start criminal procedures, finding the responsible actors, and holding legally accountable […] those who caused this situation, which through the weak quality of the works, altered project, or abuse of funds turn out to be included in this shocking affair […]. But the perpetrators may not be those that Hyseni has in mind. The Municipality of Saranda claimed that the entire project for the renovation of the water and wastewater infrastructure in Ksamil had been tendered out, implemented, and supervised by the European Union. The incident yesterday supposedly resulted from the fact that those construction works still weren’t finished, or had been finished improperly. Back in 2010, the contracting authority of the project, described as the “European Union represented by the European Commission, itself represented in view of the present tender procedure by the Delegation of the European Union to Albania, for and on behalf of the Government of Albania,” posted a “Service Procurement Notice” for the “Design and Tender Documents for Sewerage Systems for Vlora and Ksamil and Works Supervision for Vlora, Ksamil, Kavaja, Lezha/Shengjin” at the maximum budget of €1.8 million. This tender was won by IRD Engineering, which was also in charge of the supervision over the “construction of the sewerage system in Ksamil,” as they indicate on their own website. In 2011, the EU posted another tender, this time for the construction of the sewerage system itself. Lot 1 of the tender concerned the “construction of sewerage systems in Vlora and Ksamil.” The contract, at a value of €14,381,885.61, was won by another Italian company, Friulana Bitumi SrL, together with Atzwanger SpA, as announced in the award notice from June 26, 2012. The implementation of the project is supposed to take 24 months. Fast forward to January 31, 2017. EU Ambassador Romana Vlahutin, the successor of the Italian Ettore Sequi, under whose authority the contracts with the (Italian) companies had been signed, visits Vlora to inspect several severely delayed EU-funded infrastructural projects, including the sewerage system of Vlora, which was part of the same contract awarded to Friulana Bitumi and supervised and designed by IRD Engineering. Ambassador Vlahutin demands assurances that the work will be finished before the summer. Ambassador Vlahutin didn’t inspect the works in Ksamil. Two weeks ago, the media reported on the complaints of the inhabitants of Ksamil that a bad smell came from the draining holes in the street. UKS Director Sheme Luloi claimed that the inhabitants themselves were to blame, because of illegal drainage pipes they would have connected to the network. But if the entire sewerage system had just been renovated for millions of euros paid for by European tax payers, how would such “illegal” connections still be possible? To summarize: Since 2012, the EU has spent millions of EU tax payers’ money to install a wastewater system in Ksamil, which was finished 3 years too late. The moment it is finished, the municipality for whom it was built refuses to accept it (that it, it refuses to take responsibility over it), leaving the project basically in the hands of the EU. Then two weeks later, one of the pipes of the system crack open, causing massive environmental and economic damage to Ksamil. Exit has reached out multiple times to the EU Delegation in Tirana and supervisor IRD Engineering for comment on the incident. At the time this article was published, neither responded. Both the Albanian government and the EU Delegation continue to remain silent.